Visitors to London who are also transport enthusiasts (‘railfans’) sometimes ask for advice as to the ‘best’ things to see on London’s railway network. This page is part of a guide which aims to answer that question. If this is the first time you have reached these pages then it is best to go to the Opening Page which sets the scene, explains the difference between the small and the large profile trains, offers advice on the best type of ticket to buy and photography tips. Apart from the Underground, London has an extensive network of urban and suburban railway services provided by many of the mainline railway ‘train operating companies’ which provide railway services throughout Great Britain. Most of these feed into terminal stations on the fringes of ‘Central London’, however a few travel through London linking towns to the north of London with towns to the south of London. Marylebone; north-west London (some services interline with Metropolitan Line trains out of Baker Street station). Euston; north-west London (the Overground local services interline with Bakerloo Line trains). St Pancras; north London (also high-ish speed Javelin trains to south-east England). Moorgate (Northern City / Great Northern Electrics); north London. Liverpool Street; east and north-east London. Fenchurch Street; east London. (During evenings and at weekends trains sometimes use Liverpool Street instead). London Bridge, Cannon Street, Charing Cross; south and south east London, plus (London Bridge only) some Thameslink services. Blackfriars; south, south-east London plus some Thameslink services. Waterloo (East); through station served by trains to / from Charing Cross. Victoria; south and south-east London. With the exception of Fenchurch Street all of these stations are also served by Underground trains. Fenchurch Street is within walking distance of much of London‘s main financial centre, passengers needing onward transport tend to use the nearby Tower Hill Underground station. Almost all of the trains which serve these stations are electrically powered, except Marylebone, which has only diesel trains. 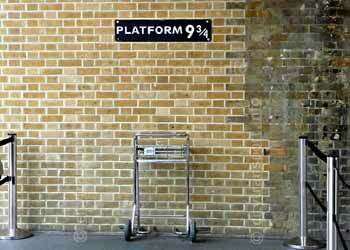 The Harry Potter platform 9¾ at Kings Cross station. Nowadays this can be found in the mainline railway station ticket sales area (booking office / ticket office) - it used to be located on one of the platforms, but was relocated when electronic ticket gates were installed as these restrict the platforms to only passengers with tickets. The Meeting Place. 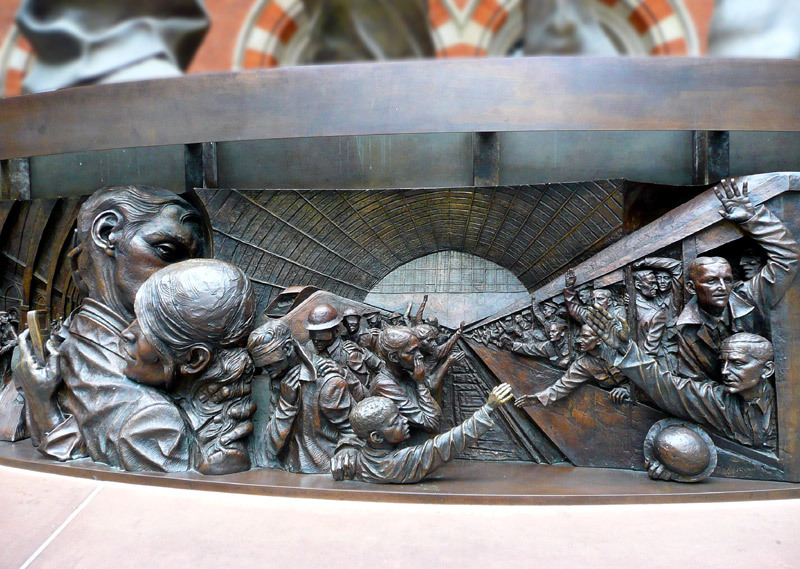 Located at St Pancras International Station this impressive bronze sculpture can be found directly below the station clock. 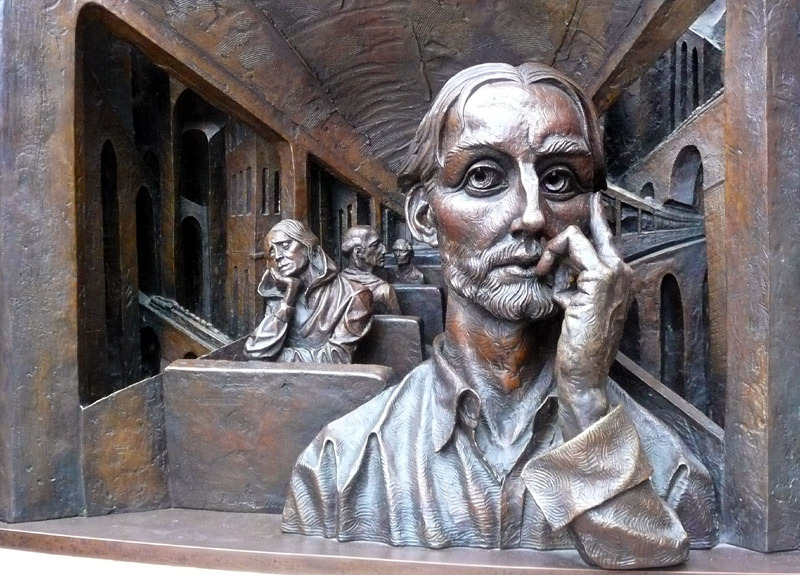 Passengers who arrive in London by Eurostar train can also see this statue by looking towards the front of the train. Just two of the magnificent mini dioramas in the plinth below the The Meeting Place statue at St Pancras station. These are best seen in the larger format which opens in new windows when the images are clicked. 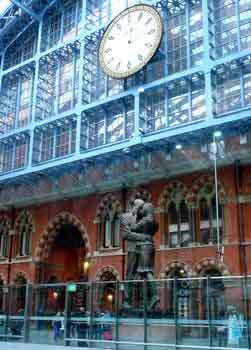 Even visitors who are not railway fans enthuse over the 20-tonne bronze sculpture of a couple in a loving embrace which is directly below the main clock and next to the Eurostar terminus at St Pancras International station - upstairs / on the floor above the retail shops. Built by artist Paul Day this bronze statue is an imposing 30ft (9m) in height and cost £1 million. 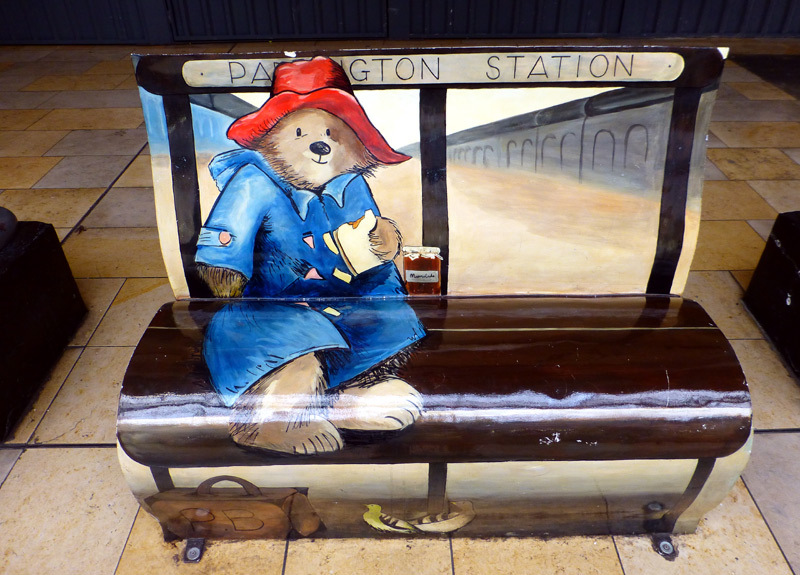 Called The Meeting Place it aims to reflect the romantic nature of train travel, and may remind travellers of a scene from a film named Brief Encounter. Note that the image showing the statue and the clock was photographed through the glass screen which separates the Eurostar platforms from the areas accessible to the general public. 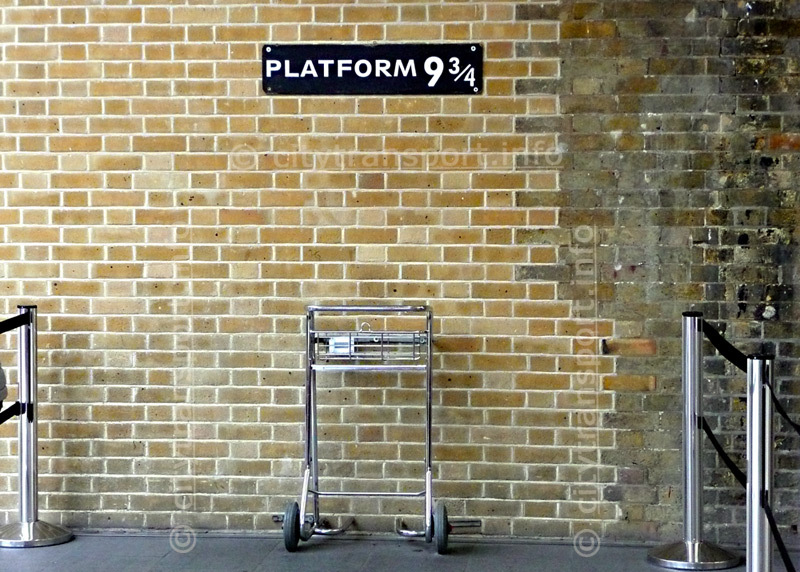 These platforms are a restricted area reserved for international passengers only and can only be reached by passengers who are travelling on Eurostar trains. 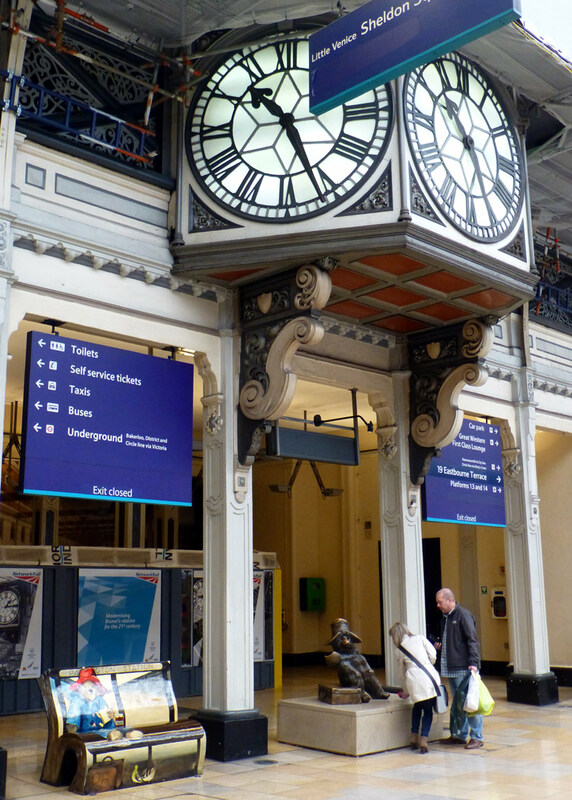 Since departing passengers are prevented from accessing the platforms until the train is about to depart (similar to aircraft at airports) so Eurostar passengers will probably find it easier to try to see the statute when arriving in London and before going downstairs to passport control. Of course it is also possible to see the statute from the public walkway on the general public side of the security glass screen. who lives under the main clock on platform 1 at Paddington station. 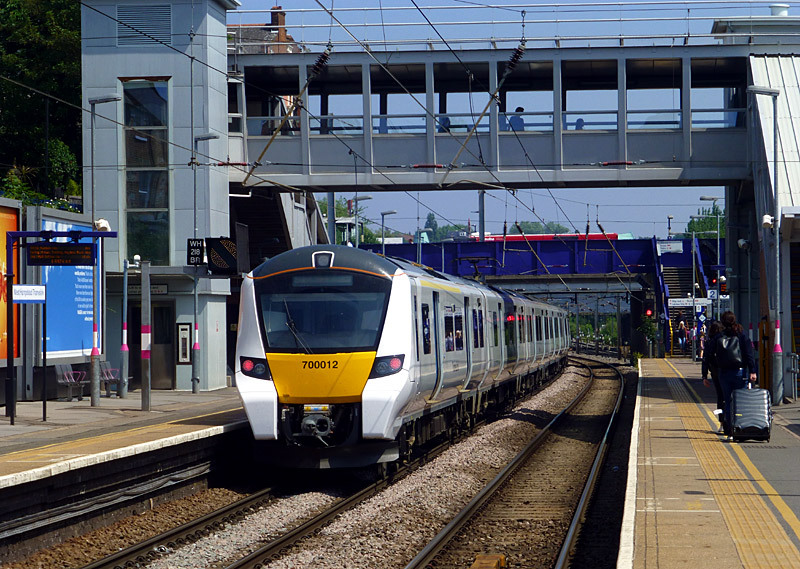 Some trains which travel to destinations away from London also serve major outer London stations, making just a few (if any) stops in the inner suburbs. Depending on the route served these journeys may take 15 - 30 minutes and the trains often include 1st class seating and free toilets. In the list below the London terminal station and name of the train operator are in brackets. East Croydon; (Victoria [Southern], London Bridge [Thameslink], West London Line [Southern]). Harrow & Wealdstone; (Euston [London Northwestern Railway], West London Line [Southern]). Harrow-on-The-Hill; (Marylebone [Chiltern Railways], Baker Street [Metropolitan Line]). 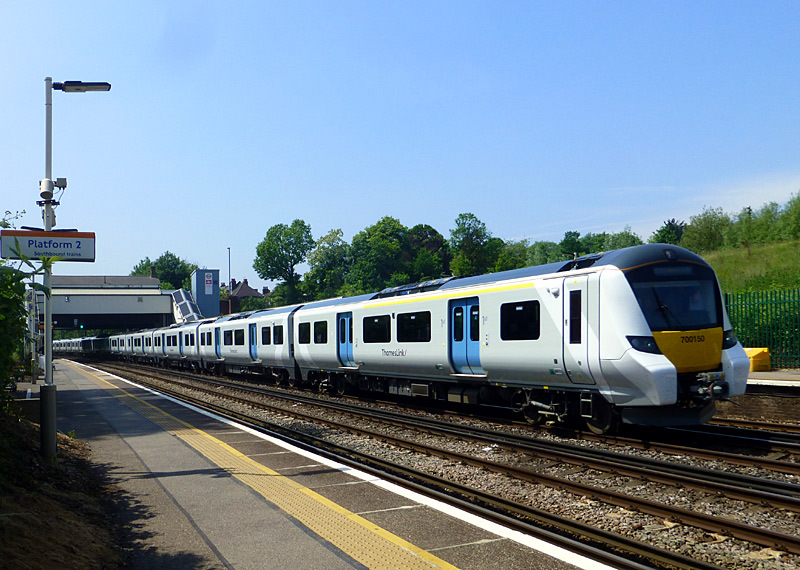 West Ruislip; (Marylebone [Chiltern Railways]). Wimbledon; (Waterloo [South Western Railway]). Richmond; (Waterloo [South Western Railway]). Romford; (Liverpool Street [Greater Anglia]) (Note: TFL Rail trains normally call at ALL stations).) . Also do not forget the Thameslink trains which often provide faster journeys (than the Underground) on north-south services through London - and have free toilets. There are also two stations just outside of the London local government area (but still part of London as defined by 'built up area') which are also served by longer distance trains that often travel ‘fast’ within London. Dartford; (Victoria, Charing Cross / Waterloo East / London Bridge [SouthEastern]). Watford Junction; (Euston [London Northwestern Railway, London Overground]) Clapham Junction / West London Line [Southern, London Overground]). Note that special fares apply at Watford Junction - the situation is very confusing. Passengers can travel to / from this station using Oyster / Contactless PAYG but the fares charged might be different than expected. Travelcards are also accepted but they must include Watford Junction as a fares zone - these are more expensive! If you want some luxury without going on a long journey then use the Heathrow Express (HeX) between Heathrow Airport and Paddington station. 1st class is especially nice, with comfortable chairs, folding tables, coat rails and more. Note that the HeX charges special fares, so make sure you know what you are paying before travelling. Being a premium service that is aimed at airline passengers they do not want to have their trains swamped by commuters and therefore do NOT accept any ordinary London tickets - no Travelcards, no Oyster cards. 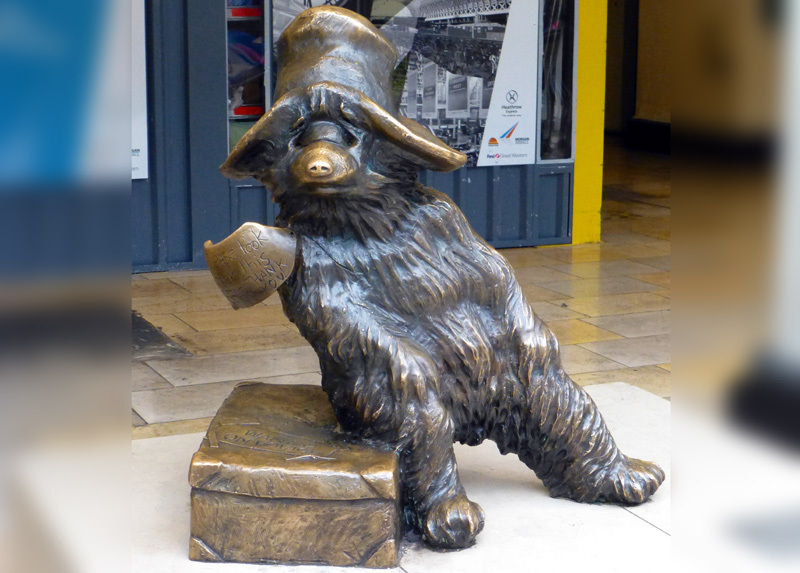 If you have a BritRail, Eurail Pass or All Line Rover then you should also check before travelling. West Hampstead Thameslink station in north London. 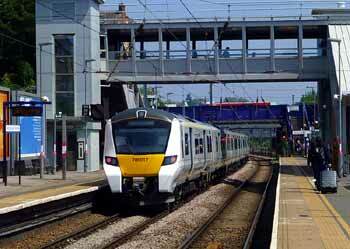 London has some trains which use both 25,000v AC overhead wire and 750v DC third rail. They all operate as part of National Rail services and include Classes 313, 377, 378 and 700 on various routes around London. Farringdon (which is served by both Underground and Thameslink trains) used to be a good station to see trains change between the two systems, however northbound trains now change from third rail to overhead wire (which includes the trains raising their pantographs) at City Thameslink station, which is underground. Other stations where this can be seen are Acton Central on the western side of the North London Line (London Overground) and Drayton Park on the Moorgate - Finsbury Park Northern City Line. A different way to experience this changeover is to travel in the part of the train that is under the pantograph and to listen to the sound of the changeover. Trains on the West London Line (WLL) between Harrow & Wealdstone / Willesden Junction and Clapham Junction also change their power supply during the journey. 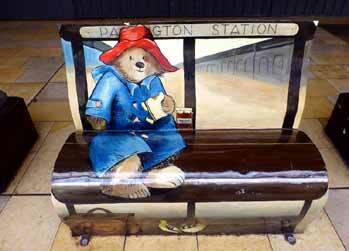 At present they do this whilst between stations but one day this will be relocated to Shepherds Bush (WLL) station. Before this can come to pass the nearby Underground route between Hammersmith and Paddington stations (via Shepherds Bush Market) needs to be resignalled, as otherwise the electric overhead wires will cause electrical interference for the existing signalling system. Also worth knowing... the Javelin trains which travel on the High Speed Line between St Pancras station and Ashford and then use normal tracks to serve various locations is south-east England also use both overhead wire and third rail power supply systems, switching between the two at Ashford station. Trains changing their power supply system can be seen on one of my 'youtube' videos which was filmed in the early 1990's. Note however that the type of train seen in this video no longer operates on this route and the location (Dalston Kingsland station) is now fully 'overhead wire' only.